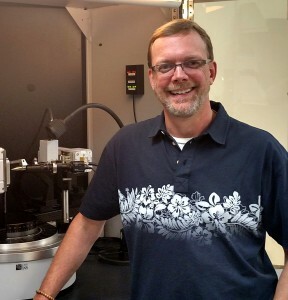 Dr. John Rakovan is a professor of mineralogy at Miami University in Oxford, Ohio. John received his Ph.D. from the State University of New York at Stony Brook in 1996 and spent a year as a postdoctoral fellow at Virginia Tech before starting at Miami. He has broad research interests including crystal growth, structural and morphologic crystallography, mineral-water interface geochemistry, and mineral deposit formation. Much of his work falls into the broad area of environmental mineralogy. He is a fellow of the Mineralogical Society of America (MSA) and has served the MSA and other societies (e.g., the International Mineralogical Association) in many capacities including the subcommittee on apatite-group nomenclature. John has been a mineral collector for more than forty years with particular interests in apatite, minerals from Japan, and specimens with interesting mineralogical characteristics (i.e. twinning, epitaxy, etc.). He has been an executive editor of and regular contributor to Rocks & Minerals magazine since 2001. In 2010, the decavanadate mineral rakovanite, discovered by Joe Marty in the Sunday Mine, Colorado, was named in his honor. One of the most appealing aspects of minerals is the regular geometric morphology of their crystals and the flat, often polished looking, faces that bound them. Symmetry of the atomic structure ultimately determines the geometric relationships among crystal faces (e.g. the angles between them) but the presence of flat crystal faces is dependent on the growth mechanism. The perfection of a crystal face depends on growth rate and its ability to grow unimpeded, e.g. into an unrestricted or open space. The specific faces that will form, for example the cube or octahedral faces on a fluorite crystal, depend on their relative energetics which in turn can be influenced by the chemistry and physical characteristics of both the crystal and the growth medium.Morphology is also influenced by kinetics including the relative growth rates of different faces. This talk will explore the various factors that influence how crystals grow into the beautiful specimens that are desired by collectors.